Some would agree with the cardinal’s statement. Others would surely think that he exaggerates any connection between worship and moral life. But the cardinal has it right. In the interview he points out the inextricable relationship between liturgy and a moral life. “To me, it’s fundamental. It’s the most important area of catechesis; to understand the worship accorded to God. The first three commandments of the Ten Commandments are to do with this right relationship to God, especially with regards to worship.” Such understanding is a prerequisite for both life in the Christian community and for evangelizing the world. It is, said the cardinal, “only when we understand our relationship with God in offering worship that we also understand the right order of all the other relationships that we have. 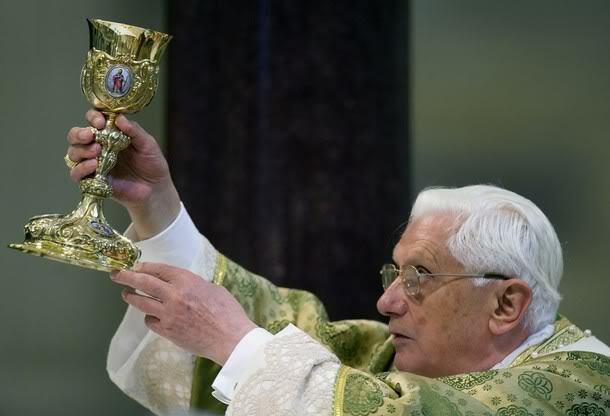 As Pope Benedict XVI said in his wonderful magisterium on the sacred liturgy and which he expressed so often, [it consists of]this connection between worship and right conduct, worship and law, worship and discipline.” Indeed, this notion is at the very core of Benedict’s teaching on the liturgy. In his book The Spirit of the Liturgy the Pope Emeritus explained that what happens in the liturgy “goes beyond the action of the liturgy. Ultimately, it embraces the ordering of the whole of human life… It is only, therefore, when man’s relationship with God is right that all of his other relationships-his relationships with his fellowmen, his dealing with the rest of creation-can be in good order.” The reason for this is both simple and profound. Cardinal Burke’s description of Benedict’s magisterium on the liturgy as “wonderful” is true, but an understatement. His magisterium is radically evangelical in the truest sense because it is focused on Eucharistic worship, which is to say it is Christocentric, and intended to lead us to understand that it is the person of Jesus Christ who is the center of all creation and life, and who holds all creation together. Benedict has taught us about the centrality of worship because it is in worship that we get our spiritual bearings, and it is in worship that we encounter the Trinitarian God in the most intense and mysterious way possible while on earth. Indeed, the Trinitarian encounter in the Eucharistic Mystery is at the heart of the individual life of each Catholic. Not surprisingly it is also true that the Eucharistic Mystery is the foundation on which the Church rests and out of which the Church was not only born but seeks to transform the world. The sacred liturgy is about Christ in our midst, leading us in the Holy Spirit to the Father, and then to evangelize the world. The sharing of a sign of peace with those standing next to us at Mass does not happen until we encounter the Risen Lord in the Transubstantiation that takes place on the altar right before us and until we are taken by the Son to encounter and even address His/our Father. It is the deep peace from this encounter with the Divine that is to be shared at that moment, and then to the world in which we live. In short, the sacred liturgy is the surest means to a right relation with God, which informs us in all of our other relationships, with our fellow human beings and with the rest of creation. And the understanding of the right order of relationships then very naturally leads to charity. The cardinal’s message, like that of Benedict, is the message of the Church itself because it is nothing less than the message of Jesus Himself. If we are to take Him to the world, we must meet him in worship in the Eucharist, just as the apostles did. However, when there is rebellion and true Eucharistic worship is distorted, changing the focus from He who is worshipped to the worshipper, there is a price to pay. If our worship of the One who is Creator and Totally Other is distorted we will lose our direction, and our relationships with our fellow human beings in society will also be distorted, if not become impossible. This is precisely why the cardinal is correct in his claim that the distortion and desacralization of the liturgy has caused so of much of the degradation of the moral life in the Church. Actually what Hart describes is a very accurate description of what happened when the liturgical reforms of the council were hijacked by some in the Roman Curia, and many more in countless chancery offices, seminaries, religious formation houses, convents, rectories, universities, and publishing companies. As Benedict and others have pointed out, there was a severance of the continuing liturgical life of the Church from the almost two millennia of liturgical life that had preceded the council. It was a rupture of continuity advanced by a liturgical nihilism, with all meaning imputed by the post conciliar progressives in their “limitless voluntarism,” imposing their individual will to turn the Divine purposiveness of the sacred liturgy into functionality for the advancement of their personal agenda (even if in some cases the actors erroneously thought that they were doing something good). That the degradation of worship and the sacred liturgy is, as Cardinal Burke says, directly linked to moral corruption is not surprising. If one feels free to impose his own will on worship and create his own liturgy, he will feel just as free to impose his individual will on morality and create his own personal moral code. The destructive liturgical revolt following the council was so powerful not only because there was a diminution in strong leadership in the Church which allowed “experimentation” and a freewheeling mindset. But also because the opportunity to impose individual will to make one’s own personal liturgy in conformity with one’s personal desires was so appealing to so many with positions of influence (great and small) in the Church. It was appealing in the same way and for the same reasons that modernism was and is appealing. Like the ancient Israelites’ worship of the golden calf, the liturgy of the Church became horizontal, focused on man and subject to man’s will. And when the focus of worship is not on the Divine, says Benedict in The Spirit of the Liturgy, “[w]orship is no longer going up to God, but drawing God down into one’s own world.” It becomes a self generated cult that is “a feast that the community gives itself, a festival of self-affirmation. Instead of being worship of God, it becomes a circle closed in on itself: eating, drinking, and making merry.” The profound encounter with the divine Persons in Eucharistic worship is replaced by a pleasant social gathering, albeit with religious trappings. Like his two immediate predecessors, Pope Francis is calling for a genuine renewal of the Church and its members, directed to the evangelization of the world. The liturgical progressives, who have never given up either their horizontal, golden calf view of liturgy or their animosity toward Blessed John Paul II and Benedict XVI for opposing that view, seem to be almost ecstatic in their belief that the new pope will allow them to again impose their individual will on the Church’s worship. The future remains to be seen, but any pope or other Church leader who is serious about renewing the faithful and evangelizing the world knows well that his effort will fail if it is not based on and does not arise from a genuine understanding and a licit celebration of the mystery of Eucharistic worship.